Lifefitness E1 Cross-Trainer Elliptical GO Console - Pacific Fitness, Inc.
Life Fitness E1 Elliptical Cross-Trainer with Go Console. 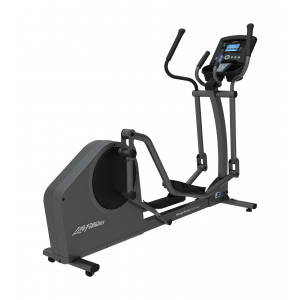 The Life Fitness E1 Cross-Trainer with Go Console offers an effective low-impact, total-body workout for home exercisers of all fitness levels. Years of Life Fitness innovation and research have resulted in an inviting cross-trainer that combines a comfortable, natural feel with outstanding durability and quiet operation. The Life Fitness Go Console provides an extremely easy-to-use interface with the essential workout programs you'll need to maintain an effective fitness regimen. The Life Fitness E1 Cross-Trainer offers a premium, club-inspired look and an eye-catching Titanium finish that accentuates any home environment. Essential programming to begin and maintain an effective fitness regimen. The Go Console offers an 4" x 6" LCD display with blue background and white characters. 16-character Workout Feedback message center that includes Calories, Distance, Speed (mph/km/h), Level, Time, Heart Rate, Target Heart Rate, METs. WhisperStride™ technology utilizes maintenance-free ball bearings, which eliminates noise and friction common with other cross-trainers. This advanced engineering creates one of the quietest home cross-trainers available and ensures that workouts don't disturb anyone in the home.